An ideal server for small businesses, Windows Server 2012 Essentials (the latest version of Windows Small Business Server Essentials) provides a powerful and flexible solution that helps protect your business data while allowing you to access the information you need from virtually anywhere by using almost any device. Windows Server 2012 brings Microsoft’s experience delivering stable server side services into your infrastructure. Windows Server 2012 offers exciting new features and enhancements across virtualization, storage, networking, virtual desktop infrastructure, access and information protection, and more. Windows Server powers many of the worlds' largest datacenters, enables small businesses around the world, and delivers value to organizations of all sizes in between. Windows Server 2012 redefines the server category, delivering hundreds of new features and enhancements spanning virtualization, networking, storage, user experience, cloud computing, automation, and more. 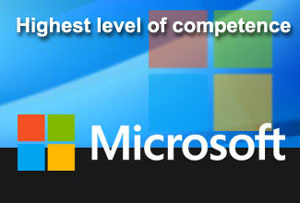 Windows Small Business Server 2008 is designed for small businesses. It is designed to work with existing technology, build on Microsoft best practices, and deliver a comprehensive network at an affordable price. It helps protect your vital business information from loss, by backing up the data on your network and helping enable you to recover accidentally deleted files. Also, it gives you highly secure access to business contacts, calendars, e-mail, files, and other important desktop resources from any Internet-connected computer, virtually anywhere at any time, so you can be productive while you are away from the office or on the road.